Jackie McNamara insists a sloppy first-half showing cost his Dundee United side dearly against Celtic. 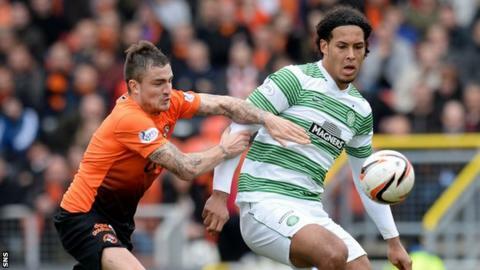 Georgios Samaras and Anthony Stokes grabbed goals before the break as the champions ran out 2-0 winners at Tannadice. And United manager McNamara felt his players were not at the races in the opening 45 minutes. "We were poor in the first half, we gave them too much space," he told BBC Radio Scotland. "We were a bit nervous in possession and let Celtic come on to us. "I said to the players, with the time and space we gave Celtic in the first half, I thought there was a lot of fear in their approach to go and push up and take responsibility, which made our forwards come back in on top of our full-backs. The goals we lost were very cheap. "Second half we were far better with more energy," McNamara added. "We got at them and had a few chances, which was pleasing, but a bit too late." Gary Mackay-Steven came on at the break for the Tangerines and looked bright, with McNamara hinting he will be in the starting line-up for next weekend's Scottish Cup semi-final against Rangers at Ibrox. "Gary gave us a lift," he said. "We were worried about him, the way he's been the last few weeks with illness and his energy levels, but you can see when he comes on he's a big player for us and that will be in my thoughts for next week. "Everyone seems to be fine and we look forward to next week."